If you would like to carry these angel collectibles in your shop, contact us for order and price information. A Sachsen Imports exclusive! Handmade in Germany! Handcrafted angels have long been a tradition in the Erzgebirge. While there are several artisan companies who make angels, we think we have found the most unique angels of all, and all are exclusive to Sachsen Imports. 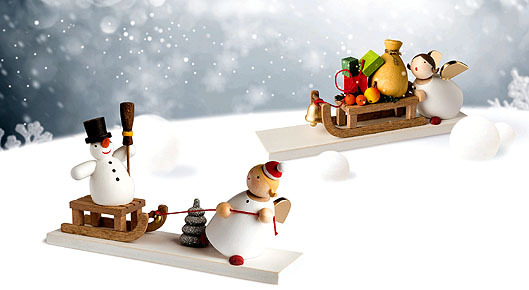 These whimsical small guardian angel collectibles embody all the traditional craftsmanship of the Erzgebirge. Each angel is lovingly crafted and painted by hand, and the artistry has been awarded the coveted “Tradition and Form” design prize in 1995, 1998, and 2005 from the Verband Erzgebirgischer Kunsthandwerker und Spielzeughersteller e.V. The story of the Günter Reichel company began on January 1, 1989 as a one-man business, and has grown steadily. Over the years, the company has succeeded in creating its own distinctive collection of characters that has gained fans far beyond the borders of Germany. To celebrate their 25th anniversary, they are releasing a new series of angels, a bit larger (approximately 3 inches tall), full of vitality, and sure to gladden the heart! Big Band Guardian Angels -- NEW SPECIAL PRICING! A modern take on the traditional angel orchestra or angel band -- the Big Band Guardian Angels! We are closing out these figures at a fantastic price - contact us for order and price information. Hans and Lotte -- the enchanting angel pair -- were born in the German village of Grünhainichen. Full of love and charm, each angel figure has a small silver-colored metal heart stamp on his or her left foot. Click on each image for a larger view and more information. Little Devil Gustav was also born in the German village of Grünhainichen. 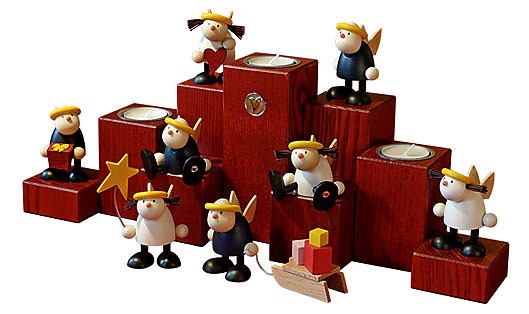 Full of mischief, each little devil figure has a small silver-colored metal heart stamp on his left foot. Click on each image for a larger view and more information.